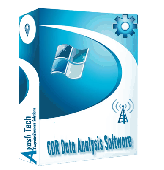 PCWin Note: CDR Analysis & Investigation 3.0 download version indexed from servers all over the world. There are inherent dangers in the use of any software available for download on the Internet. PCWin free download center makes no representations as to the content of CDR Analysis & Investigation version/build 3.0 is accurate, complete, virus free or do not infringe the rights of any third party. PCWin has not developed this software CDR Analysis & Investigation and in no way responsible for the use of the software and any damage done to your systems. You are solely responsible for adequate protection and backup of the data and equipment used in connection with using software CDR Analysis & Investigation. Analysis Studio - An intuitive and powerful statistical analysis and data mining tool. Analysis Studio features a fast deep logistic regression model development and deployment, regression analysis, crosstab tables. Clarity - The perfect add-on for any spreadsheet.Â Clarity provides 14 powerful but easy to use analytical tools for anyone using a spreadsheet. Simply copy the data and click â€œCapture Dataâ€� in Clarity to begin your analysis. StatPlus Portable - No need to carry a mainframe to perform a complex analysis when you visit a remote lab. Get the full power of a precise data analysis tool always with you. Perform a statistical analysis on-the-fly without carrying a powerful, bulky computer. Neoview Performance Analysis Tools - The HP Neoview Performance Analysis Tools provide insight into queries running on the HP Neoview data warehousing platform. Illumina cnvPartition CNV Analysis Plug-in - The cnvPartition CNV Analysis Plug-in is a software library that works with Illumina’s GenomeStudio data analysis software. TMS MALMS Office (MO) - MALMS Office Data Analysis System, which is normally run on a PC located in the Airport office, provides for the data storage, extensive analysis and reporting of the results of the photometric testing undertaken by MALMS Mobile or MALMS Static. Vision Backup Home - Vision Backup Home was designed to simplify home and home office data backups with an easy to use GUI. Backup and restore to multiple media's including CDR-RW/DVD-RW, USB/Flash Drives and Hard Drives/NAS/ZIP/JAZZ. Decision Making Software - Decision Making Software, Kepner-Tregoe matrix, method framework tool Software (Strategic Analysis, Management): The Kepner-Tregoe Matrix is a special, well-orchestrated, synchronized and documented Root Cause analysis and decision-making method. Quick Recovery FAT & NTFS - Recovers deleted data in three stages - analysis, select &amp; Save. VbsEdit Embedded - VBScript editor and debugger that lets you add VBScript macros to your C++, C#, VB.NET or Delphi application. Features include Syntax coloring, Case correction, Auto-completion, Built-in debugger, Code snippets, Object browser. More Software of "ATS Bulk-ecommerce Solutions"